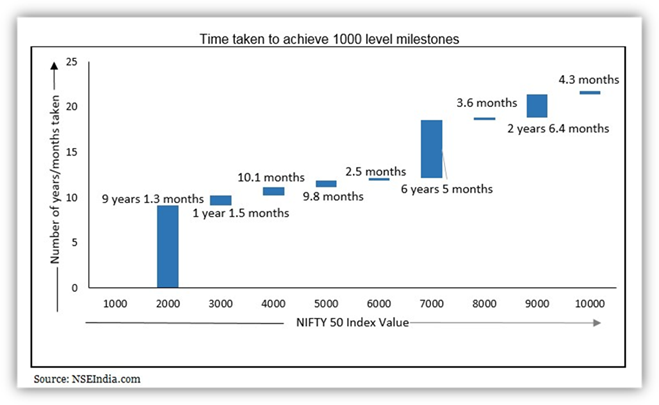 The NIFTY raced to 10,000 in about 21 years, but the journey from 10,000 to 100,000 may not that long. The rally is expected to be supported by a strong macro environment, bounce back in earnings growth, pro-growth reforms, stable political environment, and domestic & global liquidity. From its base value of 1,000 in November 1995, the NIFTY reached the 2000 mark in December 2004, taking 9.1 years to double. Thereafter, the journey was swift wherein it reached the 6000 mark in only 2.9 years. It took another 6.4 years to reach the 7000 mark in May 2014 from 6000 in December 2007. The 9000 level was achieved in March 2017 which was relatively faster from 7000 level taking only 2.8 years. NIFTY hit the 10,000 mark on July 25, 2017, taking only 4.3 months to move from 9,000 to 10,000. The current rally in Indian market is fuelled by strong liquidity from both global as well as domestic investors. Reforms initiated by the Modi-led government reaffirm the faith of foreign investors in the India growth story which could well stay for another 7 years. A recent IMF report on India GDP growth also added to investor confidence. India GDP growth rate forecast remained unchanged at 7.2% in 2017-18 and 7.7% in 2018-19 which will still be higher than China.